In this lesson, we will look at how to find the derivatives of inverse trigonometric functions. 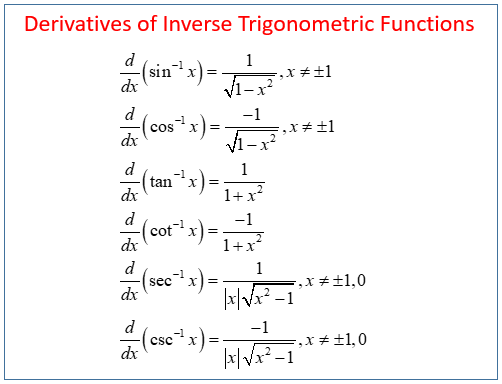 The following table gives the formula for the derivatives of the inverse trigonometric functions. Scroll down the page for more examples and solutions on how to use the formulas. We can use the above formula and the chain rule. We use the product rule and chain rule. One example does not require the chain rule and one example requires the chain rule. Find the derivatives of each given function.